I can’t add all of the Dark-Hunter role players on Facebook to my friends list and I don’t have the time to play with them as much as I’d like, but the DH Origins folks have always been wonderful to me and treat me like family. When I woke up to the usual 3am insomnia this morning, I had a present waiting for me from the Simi in the form of this beautiful slideshow video in honor of my grandmother. I’m so very touched I don’t know what to say…besides Thank You, Simi. With all my heart. I have never liked saying goodbye to people I love. I handle it a lot better now that I’m an adult, though still not quite enough to get through airport security without TSA asking me if I’m all right. When I was a little girl, every departure was a tragedy. I could never keep it together and always dissolved into tears, as if my heart were breaking into a million pieces and the glue was turning right out of the driveway, heading into the sunset. Mom would always tell me, “But if they don’t leave, they can’t come back.” Even at four years old I knew this was a bunch of illogical crap. The universe chooses its misery at random. No one can ever promise otherwise. Wouldn’t not leaving at all just be happier for everyone? I brought this up when I arrived in Vermont on Sunday, after a nine-hour drive full of music and tears and snow and dark, empty roads. “Oh, honey,” Mom replied, “you would just get so upset…we didn’t know what else to say.” And then we cried and laughed and cried again and held Memere’s hands while her fever spiked for the umpteenth time. I was raised in a very matriarchal household–both my grandfathers died before I was born, so Memere (Madeleine DeRonde) and Nana (Helen E. Kontis) have always been a very big part of my life. I am lucky enough to be namesake to both of them: it may say only “Alethea Madeleine Kontis” on my birth certificate, but since “Alethea” is not a saint, I was baptized “Eleni” (Helen) in the Greek church. Nana and Memere: two amazingly opposite ends of the grandmother spectrum. 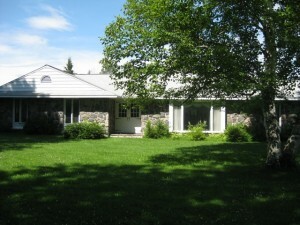 Memere lived in a stone house on a mountain in Montpelier, VT; Nana lived in a duplex in Ft. Lauderdale, FL (and still does!). Memere had retired from her government job and never worked in my lifetime; Nana retired from her retail job only just last year. 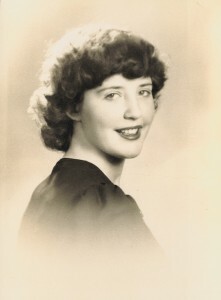 Nana was always prim and proper and dressed to the nines; beyond having her hair curled just so, Memere favored flowing shirts and elastic waistbands. Nana taught us how to take our tea and eat eggs with the Queen of England; Memere took us to pick strawberries and ate Bugles with ranch dip while we watched the Miss USA pageant. Nana sang songs straight from a British nursery; Memere warbled Louis Armstrong and Ella Fitzgerald and Rosemary Clooney. Nana expected little girls to wear dresses and ribbons in their hair; Memere expected us to look for elephants when she farted. Two of my most prized possessions are a locket Nana gave me with a picture of my grandfather and father in it, and a Who Framed Roger Rabbit beach towel that Memere received when she subscribed to The Disney Channel, just for me. 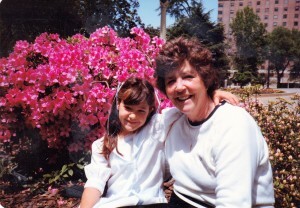 Hero is dedicated to both of my grandmothers, for obvious reasons. When I was six, my best friend was the tree in front of our house in South Burlington. I spent most of my days doing headstands or climbing trees or naming snakes or searching for four-leaf clovers. Despite loving my grandmothers equally, it’s not hard to imagine that I preferred homemade virgin strawberry daiquiris over Easter dresses. 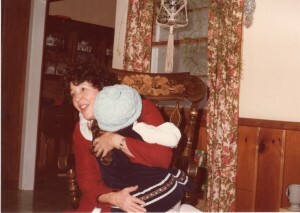 Mom said that every time Memere came to visit, she’d have to sit down before I saw her so that she wouldn’t topple over from the force with which I threw myself into her arms. And every time Memere drove away, I sobbed as if part of my world had died. Looking back now, I wonder if somehow, deep down in that genius brain of childhood innocence, I knew Memere would leave first. When Mom & Dad & Soteria & I moved to South Carolina, Memere would stay with us every winter (when she wasn’t visiting Uncle Richie in Arizona). I realize now that this was for monetary reasons: Memere rented her house on the hill to the Vermont legislature during those times and didn’t have to pay for heat during the long Vermont winters. 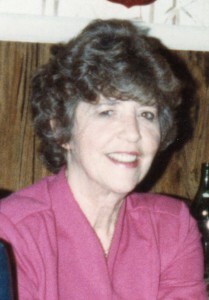 All my grade school friends remember Memere, or “Gram”, as we often called her. She was in residence for many Christmases and Chinese New Years. She looked after my sister and me while Mom & Dad took vacations in Europe. We cooked a lot and ate a lot and watched a lot of television. She even took us to movies. The last Christmas I spent with Memere was in Tennessee–I was going through a bit of a nervous breakdown at the time and was miserable to be around. She and I went to see You’ve Got Mail in an attempt to snap me out of my funk. I still watch that movie every December. The last Thanksgiving I spent with Memere was after my parents had moved to Knoxville–I recorded her saying a little something for the video I made for Mom & Dad’s 30th wedding anniversary. The Alzheimer’s hadn’t quite come to fruition then. I am so glad I made that video. In two days, my parents will celebrate their 40th. 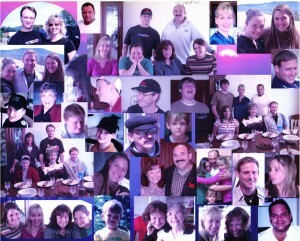 That was also the last time all four Kontis siblings were together: Cherie, West, Alethea & Soteria. It was West and I who drove Memere back to the nursing home. She didn’t want to go straight there–nor did we–so we took her on a detour up to the old house on the hill and the sign for DeRonde Road. West and I couldn’t look at each other on the way back to Cherie’s house–the only one more emotional than me is my brother, though Soteria takes a very close third. I’m not sure which of us cried more at the funeral. Not that it makes a difference. I managed to keep it together long enough to perform both readings at the church service–Soteria and I used to put on elaborate, choreographed musicals for Memere’s Ladies Home Dem group, so it was only fitting that I stand up and perform for my grandmother one last time in my tiara, stripey socks and glittery gold duster, with a fat purple flower in my hair. I only wish I’d been able to give her eulogy, but there is a limit to even my seemingly boundless talents. I keep thinking back to How I Met Your Mother, the episode where Marshall’s father passes away suddenly, and Marshall spends the entire time desperately trying to recall the last thing his father said to him so that he can give his eulogy. 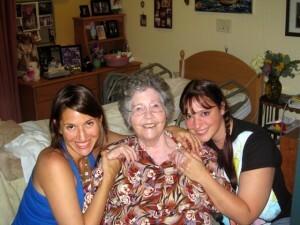 Memere did not pass away suddenly–the Alzheimer’s didn’t let her. Soteria and I last visited her in the summer of 2011, when we were in Vermont for my niece’s wedding. She had lost most of her speech by then, finishing her half-formed sentences with a melodic “do-do-do-do.” We played Rosemary Clooney for her. Charles and Soteria danced in the room. I knelt by her wheelchair and smiled up at her. 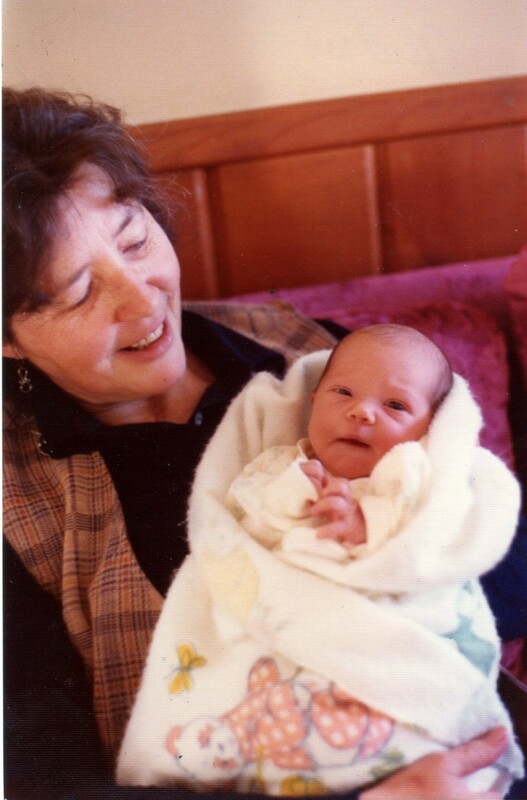 She looked down at me and said things like, “Happy…do-do-do-do” and “Beautiful…do-do-do-do.” She probably thought I was my mother, if she thought anything at all. Soteria and I took turns weeping in her bathroom. The nurses told us when we were done to wheel Memere down the hall into the atrium for snack. This seemed to distress Memere. She kept whispering “I’m afraid,” because the atrium now was and would always be a strange place to her. Soteria and I told her not to be afraid and reminded her that we loved her…and then forced ourselves to go. Thanks to Alzheimer’s, the last words I remember Memere saying were, “I’m afraid.” This has haunted me ever since, catching me off-guard at random times and shooting me instantly into deep depression. So when I found out things were bad and Mom had jumped on a plane to Montpelier, I packed my suitcase and hopped in the car, no question. My grandmother was afraid. In her last moments, I would damn well make sure she knew she was not alone. This time she was leaving and not coming back, no matter what my mother said. I would be devastated. But I would be there. All the conventioning and book touring I’ve done in the past seven years paid off–this consummate road-tripper only stopped three times: once to sign books for a Girl Scout party I’d be missing (thank you, Lesley), once to refuel, and once to pee & update Soteria before heading into the frozen, winding wilds of Vermont. I arrived a little after 7:00pm. The Ravens were already winning the Superbowl. Eventually, Dad went back to the hotel to take some cold medicine and finish watching the game. Mom and Cherie and I stayed to laugh and cry and tell stories and hold her hand and kiss her cheek and put cold cloths on her forehead. We let her know it would be okay to go into the light. She just kept hanging on. The nurses blamed it on the giggling–who would want to leave a room filled with such laughter? 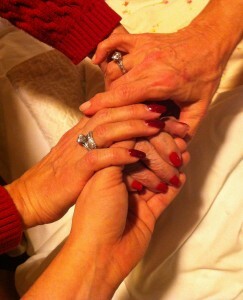 I helped hold Memere’s hands while Cherie did her nails. I summoned up a Rosemary Clooney station on Pandora and Mom set my phone on her pillow so that she’d be sure to hear the music. “Sway” was the first song that played. By “Fly Me to the Moon,” her breathing got rough, and by “Night and Day,” she was gone. I don’t know If Memere was ever conscious during those last four hours, but there were times I could swear she was looking at me as I sat on the bed beside her, so I remembered to smile. Even if I was crying, I wanted to make sure she saw me smile. Alzheimer’s made Memere forget her whole life, but she never forgot how to smile. I heard her voice in my head saying, “Happy…do-do-do-do” and “Beautiful…do-do-do-do.” For while “I’m afraid” might have been the last words I remember her saying, “Happy” and “Beautiful” were the last words she said to me. These will be the words I remember. Two words that perfectly describe the life of my beloved grandmother, Madeleine DeRonde.